eaters just pretending to be happy with their stupidly tiny portions, secretly bursting into tears every time they see a Doritos commercial? person with a normal tongue. physical flaws like this suddenly make it way harder for some of us to know when to stop cramming Hot Pockets into our cheeks. if you're eating the exact same amount as always. It's easy to blame this phenomenon on lack of exercise, or perhaps ye old "I'm not as young as I used to be"
body throw in the towel and piss off to eat ice cream and watch reruns of Frasier. remain. And once they've lost the battle, there is no backup. In practice, this means that maintaining your weight is easy as pie when you're near your ideal weight, because at that point you have an army on your side. system works just like the plot of RoboCop. remember to stay healthy and strong. These tips are taken from the tips and tricks page.. click here for more..
before each meal will stem your hunger. READ MORE ON WATER FASTING .. CLICK HERE..
CHEWING AND WEIGHT LOSS, CLICK HERE. satisfied. Most people don't€™t feel hungry first thing in the morning and that is because there is less acid in your stomach. A nap can recreate this feeling. supposed to satiate your hunger, not increase it! Reduce your carb intake to gain control over your constant hunger. READ MORE ON CARBS CLICK HERE. chewing, which psychologically triggers the feeling of satisfaction. sometimes skip meals. Breakfast is definitely not the meal the skip, as it gives you a much-needed metabolism boost to keep you going until your next meal. egg yolks and make yourself an egg white snack. directly after a good tooth and tongue brushing. This is a method used by many dieters. are not hungry directly after exercising, so this can be a great way to pass the time between meals instead of eating. does not directly cause weight loss, some people feel less hungry after drinking it. idea, as you will just get hungry soon again and require more food. into the kitchen grazing for food when you aren't even hungry. bit tipsy. 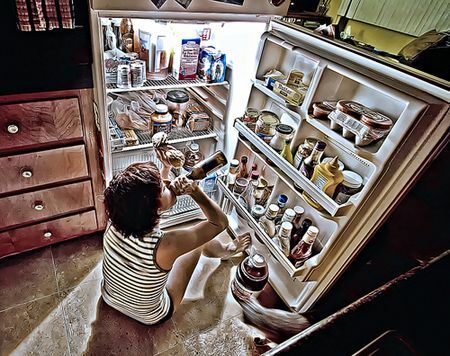 Alcohol also relaxes that willpower of yours, which makes you even more likely to go for a second helping. will have to eat before your body feels satisfied. CLICK HERE FOR CHEWING AND SPITTING TIPS. scientists, some dieters swear that sucking on a peppermint makes their body feel full when they are a bit hungry. similar to how sugar makes you hungrier than before. cold will also burn calories. manage your stress level. Stress will not only make you want to eat, it is a leading cause of overeating. temporarily mask hunger pangs. It is recommended that you always keep your stomach muscles tightened anyway, as it helps you to get your abs into shape. through eating each time you put the fork down. Some dieters will put the fork down between each bite and take a sip of water. can make yourself feel fuller, faster – and resist the urge to eat more. completed a brief survey as their ice cream was weighed. 14% when they were given a larger serving spoon. chocolate candies with a small scoop. your eyes, ears and nose have to food, the less likely you are to eat too many calories. full of food on the counter top or on the stove, where we are less likely to reach for them and grab a second serving. bedroom closet. This ensures I’m much less likely to eat empty calories. I talk about more tricks similar to this in my book “100 Ways To Boost Your Metabolism”. chocolates in the transparent jars were eaten 46% more quickly than the opaque jars! same types of candy, but you can also assume that we probably don’t change much as we age. and leave yourself less likely to overeat simply because you want to try a variety of new flavors. response to food, we can probably do a better job controlling overeating and obesity. 25 times) you allow the fullness signal from gastric hormones to reach your brain and shut down your appetite before you eat too much. their normal rate (paced by a beeping noise), or at a mix of their own rate and then the slower rate. reduction on appetite for both men and women – more than eating slowly all the way through. begin to savor every bite. close attention to a movie ate significantly larger amounts of popcorn compared to those that were paying less attention to the movie. had no story to listen to. or fresh. But when people watched the movie in a meeting room instead of a theater, they ate more of the fresh popcorn than stale. wouldn’t normally eat anyways. source.. READ MORE ON HOW TO STOP BING EATING... CLICK HERE.